Everything about Canada’s long time serving Prime Minister is supposedly counterintuitive to the country’s spirit. This, at least, is the casual response from those who have a very specific view of Canada, one infuriatingly courteous, and soporifically relaxed. But the very fact that Stephen Harper has stayed in power for this length of time, including three election victories, suggests a refutation of that view. Harper’s playbook is one that sees politics as an endeavour for its own sake. The currency of fear sluices the system. Manipulation, and targeted demagoguery, is fundamental. And there is that matter of foreign interventions and local corruption. A Harper government is not viable without corrosive corruption; a Harper government is not feasible without its staccato-like emphasis on a vision of “Great” Canada. Harper’s project on Canada was his project of Canadian conservatism writ large. The Progressive Conservative Party seemed to him spineless, lacking necessary grit to win office. His populist Reform Party became a platform to then merge with the PCP and create the current, more abrasive style we have come to expect from Team Harper. Under him, federal expenditure has fallen, while big trade deals have flourished. There is little doubt that Harper is of that tried school that lies have vast wings and take flight with repeated articulation. Having shown himself to be a friend of coal-driven electricity, he proceeded to celebrate in the September 28 leaders’ debate that, “We will be the first country in the world to effectively shut down coal-fired electricity, the biggest single source of emission on the planet.” This, from the same figure who took Canada out of the Tokyo Protocol in 2011 while waging guerrilla warfare against alarmed scientists. On refugee and immigration policy, Harper can only beam, with Canada supposedly having “the most generous immigration and refugee system in the world.” On Harper’s watch, however, citizenship was delayed, fees were raised, and immigrant selection slanted in favour of temporary foreign workers. As for the Syrian refugee crisis, Harper has done much wriggling on the subject, giving the impression that it was a recent phenomenon entirely attributable to Islamic State. Four years of history have been conveniently wiped off the slate. Refugee processing was also secretly halted this month under the auspices of vetting the list provided by the UNHCR – you could not be too careful about them for reasons of “security”. But Harper’s approach, in the manner of a political animal, was far more calculating. 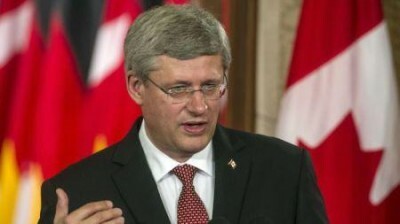 According to CTV news, the staff at the prime minister’s office were busily scouring files for persecuted religious groups who might be sympathetic to the conservative cause while also discouraging the acceptance of “applications from Shia and Sunni Muslims.” Refugees in the network of camps from Jordan, Turkey, and Lebanon were also avoided. This might well be, but it hardly explains the durability of Harper. On its basic, if not base level, Harper’s tactical outlook treats democratic parliamentary process as plutocratic and mischievous. There is always room to move and manipulate, for hard politicians to stomp on opponents while sailing close against the constraints of legality. His theft of the 2006 election, for it was regarded as something pilfered by the usually tight-lipped body of Elections Canada, took place because electoral rules were significantly bent. It was subsequently found in March 2012, a distant six years later, that the Conservatives had engaged in an illegal campaign with the use of funds and were made to pay $282,000 in fines and restitution. By then, Harper’s Teflon brand had been successfully sold for two more elections (November 2008 and May 2011). Nick Davies in The Guardian has pointed out a salient feature of the Harper book of tactics. Like his nefarious mentor of political survival, Richard Nixon, tactical sabotage known as “ratfucking” has its revered place. Interns are deployed to heckle opposing candidates; voters are harassed by impersonating campaigners calling them late at night; and false information disseminated via “robocalls” deceive electors into thinking that their polling booths have moved. The latter point received judicial recognition in the words of Justice Mosley, who would have invalidated the election but for the fact the calls may not have swung the result significantly. Leading up to the final days of this election, we can expect more of the same, those acts of desperation that have taken Harper’s opponents off guard through his rule. The only question to ask here will be whether his appeal to the darker sentiments of the civitas pulls him across the line.